Vak balesh in translation small pie, bakes on the frying pan smeared by oil in an oven or stove. Dough can be taken leavened or unleavened. Filling is made out of different groats (rice, buckwheat, oatmeal, millet) with addition of mutton, beef, byproducts or meat of bird (goose, duck). Vak balesh give on the second. Knead unleavened dough and prepare filling as for ochpochmak. Roll dough on small cakes a diameter 15 cm, on a middle lay out filling. Pinch together the edges of small cake. In the middle leave opening in a 4 cm, which is closed by the skim of dough. Balesh lay out on the oiled frying pan, smear a raw egg and put in the stove of minutes on 15-20. Browned balesh take out and opening hole, pour a bit bouillon in each. Obturate and lay in a stove yet minutes on 30-40. To the table to give again adding bouillon to every balesh. For filling to boil rice and cast aside on a sieve. To fry the finely shredded onions to the goldish color. To grind mutton pulp and to fry. To mix up the fried stuffing with rice and onions, add salt, pepper, melted butter. 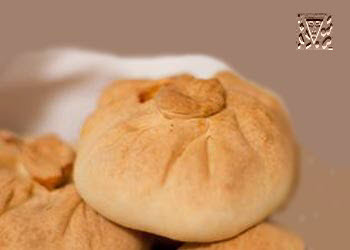 Vak balesh is baked very quickly in an oven, during 20-25 minutes.